Both provide a first survey of developing events in the GDR. Based on reports of those directly involved in protest activities, discussions with friends in the GDR and available press reports, we attempt to present a tentative survey-report of on-going developments in the political protest movement in the GDR and police reactions to it. As far as is currently clear, the differences do not lie in the police tactics being used. Police pincer tactics, arbitrary arrests, agents provocateurs, psychological degradation at the onset of custody for purposes of demorali-zation and, of course just good old beatings all belong to the standard ar-senals all too-well known on both sides of the border. The major difference lies in the social depth and breadth of the protest movement in the GDR. In our eyes, it was especially the magnitude and scope of the movement which made it possible for protestors to renounce acts of desperate militancy. If the multitude of new legislative initiatives introduced by the CDU/CSU/FDP coalition in Bonn aimed at providing more ‚domestic security‘ were a reliable indicator, then the FRG would long have become the most secure country in the world. One more time this issue deals with four of the newest of these legislative proposals for tightening up the security ship. For years the CDU/CSU has called for tougher laws for dealing with refugees and aliens. After it became necessary to withdraw its initial proposal for new legislation in this area due to the ensuing public outcry, West Germany new Minister of the Interior (Schäuble, CSU) then presented a revised version. This did not, however, result in any changes in either the content of the intention of the new legislation. If this legislation goes on to the books, it would become easier for West German embassies and consulates abroad to deny visas for persons desiring to come to West Germany. Persons denied visa would have no recourse to court review of such denial. Refugees neglecting to officially apply for the status of asylum-seeking refugees and merely basing their desire to set foot on West German soil on West Germany’s being a signatory to the Geneva Convention on Refugees would immediately become subject to the procedures provided for in the official asylum proceedings as administered by the „Federal Bureau for the Recognition of Alien Refugees“, already well known for its exceedingly restrictive interpretation of valid refugee status. Further integration of aliens who have already been living in the Federal Republic for longer periods of time continues to be dependent of fulfilling highly restrictive criteria, bordering on the prohibitive. Immigrant workers will virtually be subjected to the Swiss model of migrant labour rotation. In the future they will only be granted limited residence permits. Since 1953, a central registration service for aliens has existed which cur-rently stores and administrates roughly 100 million bits of information on a total of 10 million aliens. The now-legendary „Census Decision“ of the German Supreme Court has also made it necessary for this data bank to clean up its act and revise its legal foundations to conform to established standards of modern data protection. The numerous points of criticism directed at the initial proposal by the „Standing Conference of Data-Protection Commissioners“ (cf. the documentation and critique in CILIP issue no. 31) among others has remained essentially unheeded in the new draft proposal. This pertains particularly to the practically unlimited authority to pass on information to other agencies. On November 15th of this year, the federal parliament passed a draft of a Catastrophy Protection Enhancement Act. This act contains new far-reaching authority to enforce compulsory measures under the auspices of so-called total defense. It completely interlocks the emergency tasks with other duties which can be imposed on private citizens in the event of either civil or military catastrophies. The author places this new legislation in reference to the total legislative concept of so-called total defense legislation and ancillary measures, also including a brief overview of those compulsory measures and duties of citizens enforcable in the „event of a catastrophy“. In CILIP no. 32 we published a detailled critique of the draft proposal for a revision of the Criminal Proceedings Act, dated November 1988. This staff report provides a brief survey of the minimal cosmetic surgery which has been performed on the proposal in the meantime now to be presented in parliament as the revised government proposal. Basically these involve providing the police with the legal authority to perform electronic intelligence, use highly modern forms of observation, store and transmit information using modern methods of electronic data-processing as well as also to authorize the use of undercover agents already in operation in specific areas. Basically it has been the professional organizations of the legal profession that have formulated the most vehement criticisms of these legislative pro-posals. However, as the „final“ draft proposal indicates, the admninistration appears determined not to listen to constitutional criticisms of its proposals. A Staff-report: In 1974, a 22-year-old student and domestic intelligence agency (Verfassungsschutz) informer by the name of Ulrich Schmücker was found murdered in Westberlin. 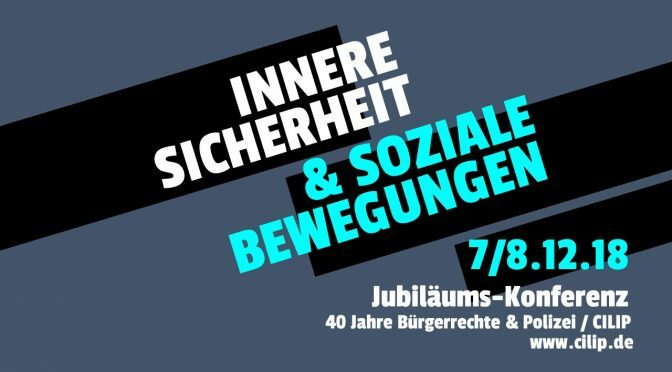 Next spring, a court will once again be forced to sit for the fourth time in this longest court trail in the history of the Federal Republic subsequent to West German Supreme Court rejection of the previous three decisions due to serious procedural shortcomings. After our last report (CILIP no. 28) which summarized the events up until the fall of 1987, the current report deals with what has transpired in the meantime in this never-ending serial production. Both the murder itself as well as all subsequent court proceedings have been seriously tarnished by this domestic intelligence agency’s string-pulling behind the scenes. What has developed, is that it has now become a known fact that the murder weapon has been deposited in this agency’s safe ever since the time of the murder and kept out of court in all of the three previous proceedings, that for years the very same agency had its own informer implanted in the office of defense counsel, and that this informer kept both the agency and government attorneys abreast of defense counsel planning and strategy developments and that both defense counsel’s and the defendant’s telephones were tapped by the same agency even after the main defendant had been released from custody (after having been kept in pre-trial confinement for eight years), and finally that the agency informer involved in the Schmücker murder was given a pay-off totalling 700,000 German marks last fall to keep him from talking. Now that last spring’s elections have resulted in a political shift of power in the municipal administration in Westberlin, there is a faint hope that more light will fall on this agency’s role in the affair. Westberlin’s new Senator of the Interior has declared his readiness to release materials and documents pertaining to the trial as well as to permit agency employees to testify in court. And in November a parliamentary investigating committee has been installed in Westberlin’s parliament with the task of determining what role the agency really and ultimately played in the Schmücker murder. On the 25th of June 1978 a bomb ripped a massive hole in the outside wall of the state prison in Celle. Immediately afterwards, police spokespersons announced that terrorists were suspected of having attempted to free com-patriots. It wasn’t until 1986 that it came to light that this bombing of the wall in the state prison in Celle had, in fact, been performed by a domestic intel-ligence agency in an effort to insert its own undercover agents into the Federal Republic’s terrorist scene. This scandal led to the creation of a parliamentary investigating committee in the state parliament of Lower Saxony which filed its final report this past fall. The authors of our report served on this investigative panel as representatives of the Greens. They have previously reported in this journal on the initial phases of the investigation and the further developments up until the the middle of 1987 (CILIP no. 27) and now complete this task by filing this final report on the work of the investigating committee. It indicates the growing importance of police and domestic intelligence agency recruiting and use of criminals as agent provocateurs in their attempts to gain access to the milieu of politically motivated as well as common crime. As the committee’s investigative efforts reveal, however, the only real successes have been in solving crimes which police and domestic intelligence agents had themselves set up as stinger operations to gain access to corresponding circles – in conjunction with the competent assistance of a private investigator who has been on the payroll of the West German private insurance industry for years. Since 1968, the Federal Ministry of the Interior collects and publishes sta-tistics on demonstration activities in the FRG, including among other details, an annual sub-statistic on the number of „violent demonstrations“ (cf. the documentation in this issue). When the CDU/CSU/FDP coalition in Bonn stiffened up the the penal code with respect to demonstrations two years ago, while simultaneously de-liberalizing the demonstration legislation on the books, one of its arguments involved providing documentation on an increasing number of violent demonstrations (cf. CILIP no. 29). In reality, however, these official statistics indicate exactly the opposite, namely that the percentage of violent demonstrations has been on a constant decline. But there’s more to the story: The administration’s response to an official inquiry of the faction of „The Greens in Federal Parliament“ is a prime example of how well the administration has come to master the art of lying with the aid of statistics. Since 1980, demonstrations have been classified as violent even if they have only involved such forms of civil disobedience as sit-down blockades or if „insults“ have emanated from within their ranks. Not only the President of the United States has declared „war on drugs“. Similar proclamations are also coming en vogue in the FRG, including „moral campaigns“ and other police activities so popular among German mass media audiences. Activities, however, which hardly ever have any effect except to facilitate arrests and prosecution of addicted drug abusers and small-frydealers. This study documents the staging of such a campaign in the Lower Saxony state capitol of Hannover. On June 30th, 1989, a minor traffic accident in Essen escalated into a major police alarm, during the course of which a thirteen-year-old Turkish junior high school student was fatally wounded by shots from police weapons. On September 8th, the state’s attorney responsible for investigating the legality of what had taken place, declared his investigation completed and the case closed. According to his report, the two policemen responsible for the student’s death had acted in self-defense. As our author (Member of the „Action Comittee to Support the Investigation in the Case of Kemal C.“) indicates, these results completely contradict the facts ascertained by in-dependent investigators of the incident, as both the attorney of the victim’s family and the Action Committee to Support the Investigation in the Case of Kemal C. have publicly announced.